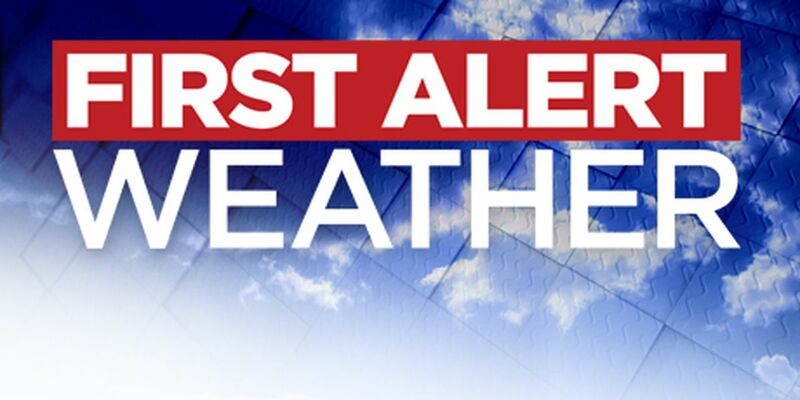 First Alert 7 Forecast: A nice week to start but rain chances are increasing at the end of the week. LAWTON, OK (TNN) - A few very nice days are expected this week but rain chances will also be possible for a few days. Clear skies this evening and tonight with temperatures falling into the mid 50s by 9PM and around 40 by morning. Mostly sunny and nice again tomorrow but south winds will be stronger at 10-20 mph. Highs in the mid to upper 60s. A cool front will move through tomorrow night into Wednesday, bringing a chance of isolated showers. Lows in the mid 40s and highs in the low 60s Wednesday. Thursday looks great with increasing clouds and highs in the mid 60s. Lows in the upper 30s. A stronger storm system will arrive Friday and linger into the weekend. Scattered showers & storms are possible late Friday and the best chance looks to be Saturday. The severe threat appears low at this time. Clouds may linger Sunday and Monday but rain chances should stay very low. Highs in the low 60s Saturday and near 70 on Sunday and Monday.